Teaching artists from Early Music Seattle have shared their skills with thousands of students in dozens of schools in Seattle and the region, inspiring children and teens with an insider’s glimpse of world history. "Early Music Seattle Teaching Artists are engaging, creative, communicative, and tenacious, as well as excellent role models for our young musicians." All programs work in large and small group settings across the K-12 spectrum. These presentations are especially resonant for social studies (World History, Ancient Civilizations, Human Geography) as well as general or instrumental music and ELL. The underlying message of honoring our similarities and differences spans grades and topics. Our teaching team’s emphasis is on short- and medium-term residencies that empower students to develop hands-on skills. Demonstrates and analyzes the connections among the arts and between the arts and other content areas. Understands how the arts influence and reflect cultures/civilization, place, and time. 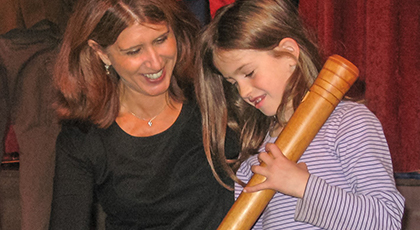 This interactive performance of music from ancient times to the present inspires elementary recorder students with demonstrations of the instrument’s wide range of musical styles and possibilities. Fifteen instruments are used, from the tiny sopranino to the six-foot-tall great bass! Music had an important role in early European societies as it does in our own times. This program demonstrations little-known instruments such as the hurdy-gurdy, viola da gamba, and medieval fiddle and harp, with participatory singing in Middle English and other medieval European languages. An introduction to the favorite pastimes of 18th century America, including participatory dance. This program can be expanded into 2-day mini-residency, with demonstrations of music and participatory singing on Day 1, followed by participatory dancing on Day 2. 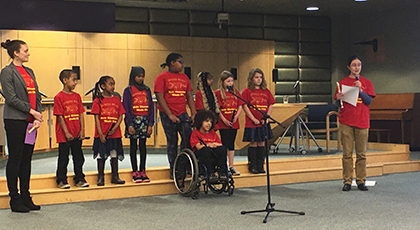 The program ties into the 5th grade curriculum in Seattle/Bellevue schools. This presentation includes participatory singing and dancing to the most popular tunes on the Trail, plus a bit of history about preparation for the 6-month trip (making clothes etc. ), and life on the Trail. The program ties into 4th grade curriculum in Seattle/Bellevue schools. 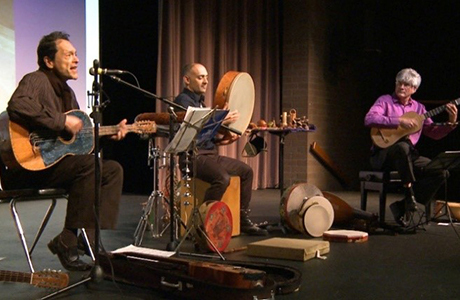 Interactive assembly or in-class workshop with trio (recorder, oud/lute, percussion) that introduces students to the music and instruments that created the soundtrack for trade routes stretching from ancient China and Japan to Italy, from the time of Rome to the Middle Ages. 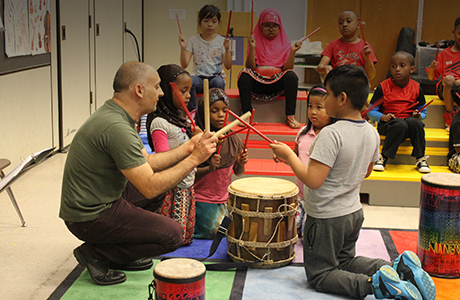 Students hear – and through rhythmic activities – help perform music, as they hear stories and adventures from the famous Silk Road across Asia. With a repertoire that spans the Middle Ages, the Golden Age of Islam, the European Renaissance, the Encounter between the Old and New Worlds and the Middle Passage, Trio Guadalevín uses guitars, lutes, voice and percussion to make connections across seemingly different cultures – connecting North Africa with Southern Europe and the Middle East, and exploring the confluence of Indigenous, African and European elements that are the foundation of Latin America. Offered in partnership with the Jack Straw Cultural Center, Mexican folklorist Abel Rocha offers a new multi-week residency. Children learn and perform folksongs from Jalisco, Guerrero, and Oaxaca states as they are immersed in Mexican culture and the Spanish language. The final project is recorded by the Jack Straw Cultural Center. Gary Stroutsos explores the natural rhythms of the universe through time honored stories and songs from diverse cultures through his one of a kind world flute collection. Through his lifetime Gary has gathered personal stories and music from American Jazz, Afro Cuban, Pan Global, British Isles and his most important work keeping the “old songs” alive of the North American Indian. Gary’s direct work with the North American Indian Northern Plains and SW canyon lands has been an honor for him to carry forward the music a commitment he has made to the elders. Every flute song has a story ~ stories matter to our young people. To learn about program and artist availability, as well as funding support for qualifying schools, please contact Early Music Seattle at 253.686.3574 or email Donna Knudson.